According to scientists at the Hull York Medical School “If you suffer from Chronic Fatigue Syndrome you may well find that your symptoms are significantly reduced if you regularly consume dark chocolate – that means chocolate with a high cocoa content and without any milk in it.” The scientists completed a pilot study to see if chronic fatigue patients would see a benefit consuming dark chocolate. Not only did they see a benefit, two of the individuals in the study who had been disabled were able to return to work. Since most people with Multiple Sclerosis (MS) and Fibromyalgia experience Chronic Fatigue Syndrome at some point in their disease, this study will be beneficial to anyone suffering from an auto-immune disease or finds the need to see a Rheumatologist in addition to those diagnosed with chronic fatigue syndrome. According to Prof. Adkins, “polyphenols are present in large quantities in dark chocolate. Polyphenols have been linked to reductions in blood pressure, as well as other health advantages. Atkins and team believe the polyphenols are having an impact on levels of serotonin in the brain.” Beyond chocolates have high amounts of polyphenols. I was very interested in this study because I noticed the same benefit personally as did the individuals in the study. I have been dealing with fibromyalgia and chronic fatigue for over 13 years. I was introduced to a product called Beyond healthy chocolate over 5 years ago. At first I did not believe there was such a thing as a chocolate that was healthy but I quickly learned by researching that dark chocolate is beneficial. I noticed the more high antioxidant Beyond chocolate products I ate, the better I felt. I was ultimately able to stop taking many of the medications my rheumatologist had prescribed with his blessing including Lyrica. Not only was I experiencing side effects to medication like weight gain and drowsiness, the co-payments on some of my medications were quite expensive. Since trying the Beyond chocolate over five years ago, I have never stopped eating it. Instead of gaining weight eating chocolate, I have actually lost significant weight instead. This chocolate does not have the waxes, fillers and processed sugars like candy. It is also diabetic friendly and gluten free. I also learned while doing my due diligence into the Beyond Healthy Chocolate Company business plan that not all chocolate is made the same. It is very important to invest in chocolate that is cold pressed and not heated at high temperatures like candy. Cold pressed healthy chocolate has the antioxidant content as found in raw cacao but has a high end dark chocolate taste that we all crave. This is completely different than the candy chocolate you find in the grocery or big box store. Researchers at the Hull York Medical School study said “It became clear to the researchers that those consuming the high cocoa content dark chocolate were experiencing a significant alleviation of their chronic fatigue symptoms. Two of the patients, who had been off work for six months, managed to get back to work.” These are big deal quality of life benefits which should be considered by those suffering with chronic fatigue syndrome. Those suffering from Chronic Fatigue Syndrome, Fibromyalgia, MS or other auto-immune related illness may wish to consider incorporating healthy chocolate into their diet. I also include the Xovitality anti-aging capsules heart & brain, antioxidant power & energy & immunity most days as I notice an improvement in my leg pain when I take them. I specifically take them if I have to be active which normally causes pain. Everyone is different but I find that including more high antioxidant dark chocolate has been a major benefit for me. Change Your Chocolate, Change Your Life Opens in a new windowOpens in a new windowis the motto of Beyond, the Healthy Chocolate Company. Why not incorporate Beyond chocolate into your diet and see how you feel. Once your chocolate arrives you will want to watch for any benefits you feel. You will want to consume a minimum of three pieces of healthy chocolate throughout your day. Feel free to eat more if you are having pain. Let each piece melt in your mouth to release into your vascular system. I recommend the Beyond Healthy Chocolate Value Packs–Be sure to check them out. You get the best bang for the buck. Sign up for the Chocolate of the Month Club (our monthly subscription) and you receive a FREE product of your choice every third month for the first year! (Cancel or make changes at any time) I am Lynette Henk of Three Sons Marketing LLC, fellow Chronic Fatigue Syndrome patient and consultant for Beyond healthy chocolates here in Southwest Florida. 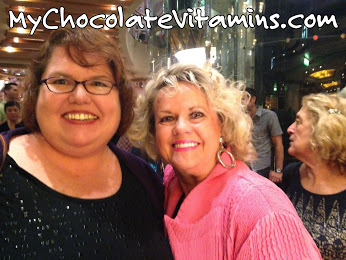 I can be reached at 941-216-5727, you can visit our website at MyChocolateVitamins.com.